SOUL FIRE is the fire within you, that burns for love, peace, happiness, joy, harmony and compassion within you and for humanity. It is the Soul Fire that offers you an opportunity to be more than you thought possible. It is the eternal fire of youth within that sparkles and shines eternally whatever your age. You see it in your eyes. You feel in in your Heart. You believe it in your mind. You create it in your life. Soul Fire is the possibility within you, that longs to linger for more value, creating activities that create value for humanity. Soul Fires asks us how we will serve humanity with the changing times. It really is not easy with all the sudden changes happening and the root old structures being uprooted. It calls for a new celebration of life – a new seeding of celebration of the blossoming of the new. Happy Full Moon in Gemini (Air) with the Sun in Sagittarius (Fire). We have the TWINS and the ARCHER at opposite ends. We have the need to fire our arrow (Archer) far ahead, into the unknown, asking us to charter the road less travelled. We have the Twins communicating constantly to improve mental thinking, communication, understanding, synergy and empathy. The Soul soars in the Air with the Fire. We seem to be closing in with this Full Moon. It seems to shine brightly, saying to us that Everything has Soul. The Moon has a Soul. The Sun has a Soul. You have a Soul. Your partner has their own Soul. Everyone has a Soul. What do you think about that? Do you agree? When you think of the Moon as having a Soul, what do you see, feel or think? If Everyone has a Soul, then if feels logical that, Every relationship has a Soul. You have a Soul. Your relationship has a Soul. Your money has a Soul. Your business has a Soul. How does this make you feel? What does it make you think? Gemini likes to think. It likes to communicate. It likes to engage. The interlinking of the elements work so well together, like the Beaver. The Beaver is always busy working away co-creating with other Beavers. The Beaver energy is always doing something constructive and creating value. This Full Moon actives your creativity, your diligence and your duty to complete tasks effectively and professionally. This Full Moon allows us to look at the goals we have accomplished and the memories we have as a result. Activate your Beaver energy and work ethics and deliver the great results you want in your life. So what are you celebrating in the glorious light of the Full Moon. You are on stage with the Full Moon shining on you. What are you celebrating. In achieving anything, we call forth a team, we call forth action, and we call forth good constructive thinking, that motivates, inspires and delivers great results. We want engagement, we need engagement, we choose engagement. WHAT AM I CELEBRATING? 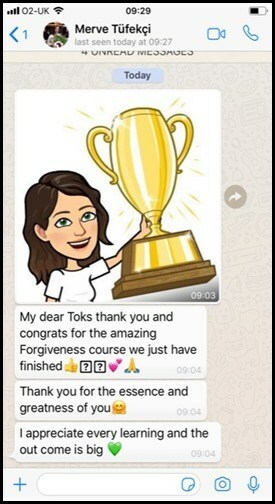 I am celebrating the success of my 8-Weeks of Forgiveness Course and the feedback I got. Thank you Merve Tufekci. Thank you Students. Thank you Universe. Thank you Clients. Thank you Forgiveness. Thank you Universe. The course can be downloaded too, in audio and Zoom video. The coming together of opposites (Gemini and Sagittarius) creates a balancing act with this Full Moon. Never give up. Stay focused no matter what. See each disappointment as a blessing, which you just cannot see at the moment. Call in Beaver medicine for good luck and prosperity in your life, your business and your career. So this Full Moon activate your never giving up on yourself. Redefine your vision from what you have achieved and completed this Full Moon. Activate your insight and foresight to the unknown. Expand your horizon and take a leap of faith in the Air motivated by the Fire in your heart and storming away with determination, focus and stamina. Persevere. Be a Master Builder like the Beaver. Be a Master Shooter like the Archer. Be a Master Communicator like the Twins. Be a Master Achiever like the Fire. Be a Master Soul invisible like Air. Be a Master of your Mind rather than let your Mind Master You. Having meaning in your life is so important, especially now. If you are feeling you have lost your life, your focus, you have lost you. That is OK. You have been working with the cosmic energy of confusion. This indicates a shift in mindset, a shift in energy, a shift in your Soul. An alignment. An expansion. An opening. You are awakening to a new dimension of you which is actually the full dimension of you, but you did not know it, till now. You have journeyed through your suffering and you are out of it. However, I am aware, that you may still be going through suffering, but you are plodding through the mud and you are feeling great, knowing deep down you will accomplish and that “This too will pass.” Enjoy your growth. Enjoy your learning. Above all, give thanks. What magic are you weaving this Full Moon? What abundance are you celebrating this Full Moon? Activate your celebration of your life. Activate the momentum of power and security as you build, build, build and build. You are the Master Creator in your life. You are the Master Doer in your life. You are the Master Teacher in your life. You are the Master Doer in your life. Congratulate yourself. This Full Moon remember that hard work pays. People who care for you reveal themselves. Be also aware of those who do not support you or like you and want to sabotage you. There are always two sides to a coin, just like the two sides of a coin. Watch your steps. Be mindful of what you do and say. Watch your back, your steps and were you go. This is the warning of this Full Moon. Beaver and Archer work together to achieve their goals. Let us celebrate this Full Moon with every aspect of our Soulful Life. Amen. Amen. Amen. and Amen. WHAT AM I CELEBRATING? 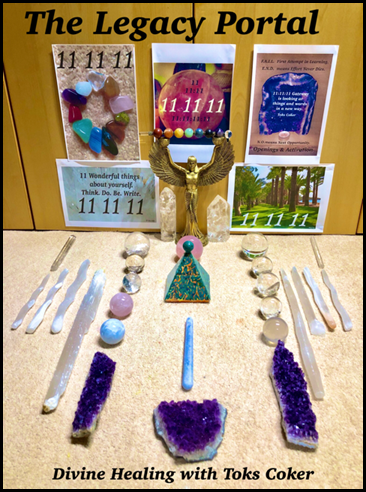 I am celebrating the 11:11:11 Portal Meditation we did, which was a great success and the meditation is still being bought. It can be downloaded in audio or zoom audio. Let us take action. Let us have faith. Let us activate hope. Let us feel the support from unexpected people showing you warmth and care in friendship. Let the vulnerable you shed the tears and allow more opening of your heart. Remember you have to open you heart to allow more in. You have to take action – either in your pain, your vulnerability – and face the truth of your life and your actions. You have to hold the bow and arrow and aim it to where you want to get to. Then fire your bow with the power and velocity of the wind and the light. You open up greater possibilities, hope and faith in your own ability, to move forward. Congratulations. 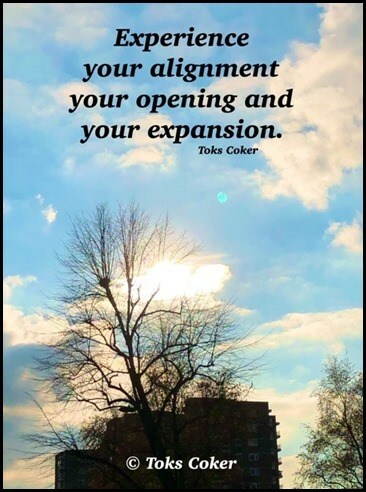 Experience your alignment, your opening and expansion. Allow your insights and life to bloom and welcome the gift with this Full Moon Gemini. Play like the Twins. Lighten up and have fun like the children. Honour the child in you. Love the child in you. See you on line on Zoom so you can join in from anywhere in the world. Let us discover more in the Gemini Full Moon Meditation. …… Congratulations.